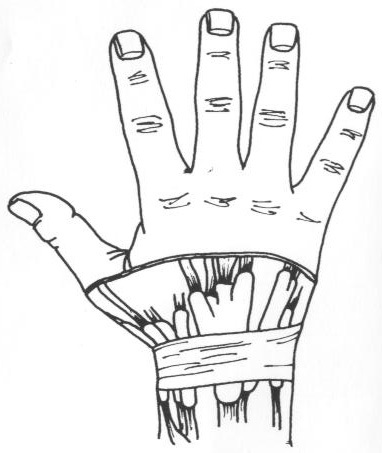 Fine dexterous motion of the hand is dependent on coordinated activity of many muscle groups. 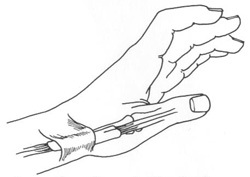 Tendons which connect the muscles of the forearm to the fingers and thumb lie on both the palm side and the back (dorsal) side of the hand. They are like little ropes that run in well defined spaces between the muscles of the forearm and the bones of the hand. 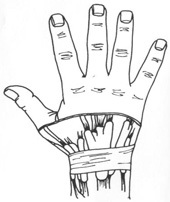 On the back of the hand, the tendons run out over the wrist in six compartments. These compartments keep the tendons in the correct position to allow them to have maximal mechanical advantage in moving the fingers. The compartment closest to the thumb contains two tendons which help elevate the thumb away from the rest of the hand: the extensor pollicis brevis (EPB) and abductor pollicis longus (APL). They are also used in motion of the wrist. Like tendons elsewhere in the body, especially when enclosed in small spaces like the dorsal compartments, the tendons or linings of the EPB and APL can become inflamed (tendonitis or tenosynovitis). This causes swelling and scarring and the tendons can no longer freely move in the normally well lubricated compartments. Inflammation can be caused by repetitive activity such as swinging a hammer or by underlying conditions which may afflict the whole body, such as inflammatory arthritis or even pregnancy. Often the cause remains unknown. The condition is much more frequent in women than men, and is most common in 30 to 50 year olds. Patients complain of pain over the thumb and radial (thumb) side of the wrist. This is worse with any activity that requires ulnar deviation (moving the wrist sideways towards the little finger). There may be swelling over the radial side of the wrist. Use of the thumb may be painful. Injecting the area of inflammation with a steroid medication, sometimes in combination with a splint to immobilize the thumb is very helpful in treating this disease. A number of injections may be necessary. A small number of people are allergic to steroids,which may cause skin discoloration, or even weaken the tendon. These side effects are rare, however, and usually steroid injection is the safest and most direct method of treating this condition. If a patient’s occupation requires repetitive use of the hand and thumb, light duty or release from work may be recommended for a short period of time. Sometimes, such conservative treatment is not effective in relieving the symptoms. Then, surgery may be warranted. This is done as an outpatient, under local anesthesia. The wrist or whole arm is anesthetized, and an incision is made directly over the inflamed tendons. The thickened, scarred lining of the first dorsal compartment is removed, releasing pressure on the tendons and allowing free motion. A dressing is applied, and this is removed along with the stitches in 10 to 14 days. It is important to keep the hand elevated and the fingers moving during the post-operative period to prevent swelling and stiffness. It is usually possible to resume light activities shortly after stitch removal, and heavy activities within 4 to 6 weeks.